Richard Linklater’s Boyhood isn’t like any film I have seen before in quite some time. Filmed over twelve years and featuring a cast that literally grows up on screen, Boyhood is Linklater’s biggest and boldest experiment yet. The closest companion to Boyhood is Linklater’s own “Jesse and Celine” trilogy, but even the Before films are more condensed, each taking place every nine years. But Boyhood is singular and definitive in its storytelling, chronicling as a young child progresses from boyhood to manhood. With its graceful humor and genuine tone, Boyhood could be the best picture Linklater has done to date. The central character is Mason (Ellar Coltrane), who lives along with his sister Samantha (Linklater’s daughter Loreli) in his single mother’s household (she’s played by Patricia Arquette). Mason’s parents are divorced and his father (Ethan Hawke) is a free-spirited liberal who still cares for his children. As time goes by, Mason and his family face various challenges and obstacles to their life, including struggling for money, facing the drunken anger of an abusive stepfather, and finding first love. There is no overarching goal or objective throughout Boyhood. Rather, Linklater’s objective is to do cinema’s most definitive purpose: replicate life with art. The episodic nature of Boyhood stresses the unpredictability of Mason’s and by extent the viewer’s own childhood. Settings change as Mason moves from place to place in Texas and faces appear and disappear. Problems come and problems go, only to come again. The pattern surely follows life itself, proving that Boyhood is no childhood fantasy. Though as I said before it shares much in common with the Before pictures, Boyhood also bears the mark of Linklater’s cult classic Dazed and Confused in its depiction of teenagers and more importantly pop culture references. Boyhood’s soundtrack is sprinkled with songs from the likes of Bob Dylan and Paul McCartney as well as the various fads and fandoms that persisted in the past twelve years, from Dragon Ball to Harry Potter (somewhat coincidently, there is a scene shot roughly in 2008 when Mason and his father debate whether a new Star Wars movie in the near future). Perhaps what’s most miraculous about Boyhood is how beautifully it transitions over the twelve-year period. Linklater’s decision to film the project real time with the same cast (which he kept rather secretive until only recently) only adds to the authenticity of Boyhood. It’s not only impressive that he consistently maintain the picture without it flying off the rails but how impressive the end result is. Seeing Mason as a lonely child become a yearning teenager is about as truthful as film is. And that is Boyhood’s intention: represent the audience’s own coming-of-ages. While many people likely haven’t faced the same challenges as Mason, his childhood will certainly parallel many (I share many of the same anxieties, for example). Boyhood doesn’t offer any real ending, but it doesn’t need to (though if Linklater does pursue it, I would much look forward to a possible sequel). What it does is show the most important time in anyone’s lifetime. 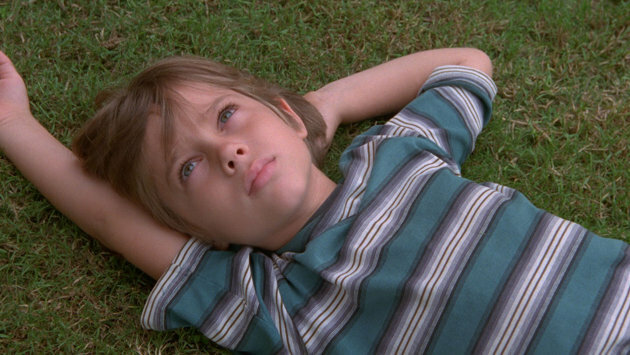 Boyhood’s loftiness further shows that Linklater is a master of reality and one of the finest directors working today. « What is Your Favorite Richard Linklater Movie? It truly is a movie that needs to be seen, in order to be believed. By far one of my favorites of a pretty strong year so far. Good review. Thanks! I agree, I’ve already seen a few great films this year (Budapest, Life Itself) and this leads the pack thus far. Nice review. I think this could well be his best film (and I’ve always loved Dazed And Confused). I watched it last night and I’ve been thinking about it a lot since I left the cinema. Great performances, and really well executed. Thanks! I think a good argument could be made this is his best work. I really want to check it out again now. Me too, might go again this week! It’s a shame that 99% of people still can’t see this film since it’s still only playing in 33 theaters across the entire U.S. It hopefully will expand soon as I want most people to see this. A superb film. Great review mate. Just found out my local cinema has got a couple of limited showings this weekend so I’m gonna really try and get to one of them. Thanks! See Boyhood as quickly as you can, I can’t over-exaggerate how great of a movie it is.